This month, I am so excited to be participating in my first show at City Art Cooperative Gallery in San Francisco! Check out my new portraits! I have been wanting to experiment with different time periods and seasons for a while now, and getting into City Art Gallery gave me the opportunity to play around with some new portraits! I am inspired by all the strong women that lived through out history. This was inspired by my love of Jane Austen and the English countryside. Here's Miss Emmeline and the buzzing (and stinging) of her springtime bees. 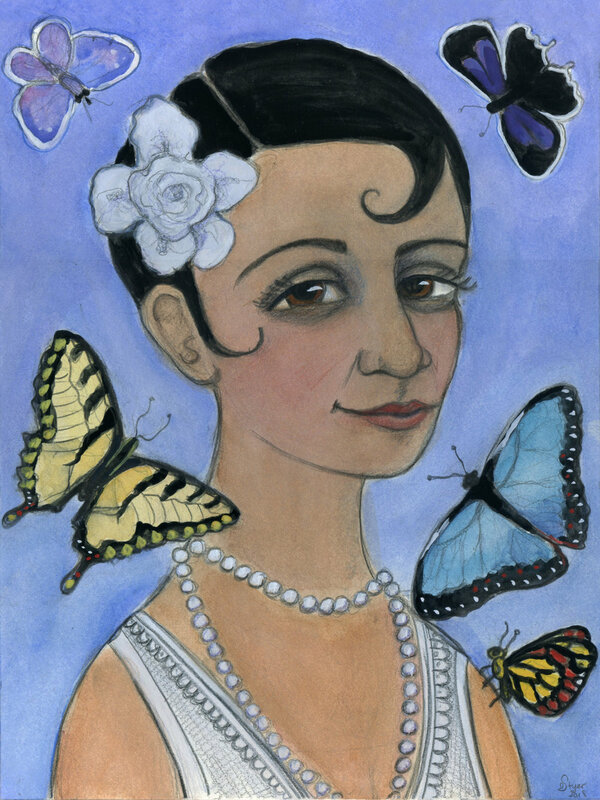 My summer portrait was inspired by the amazing style of the Harlem Renaissance and the 1930's. I imagine Miss Georgette listening to with the music of Billie Holiday as the summer butterflies dance around her in the summer wind. Of course, I need to have at least one dark Victorian portrait. Here's my inspiration for a 19th Century Fall portrait of the wonderful Miss Thora as she hides in the deep dark woods with her adorable (but very scary) little owl friend. My winter was inspired by the fashion of Queen Elizabeth and her contemporaries. I love all the crazy stiff collars of this time period. Could you imagine what it must have felt like to wear such things. This is my winter wonderland portrait of Miss Sybyll and her pet fox, Finn. If you want to see the portraits in person, they will be hanging at City Art Gallery until April 1st. UPDATE: Prints now available in the Shop!